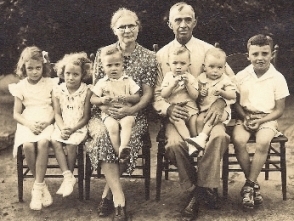 Most memories of Mama Hassie and Daddy Cliff are about things that occurred at the �Dawson Homeplace�. We visited there often � during the week and weekends. I remember being there during �hog killing� and �working the meat� in the kitchen after the hogs were slaughtered, cleaned and butchered at the fire pot near the branch below the big house. 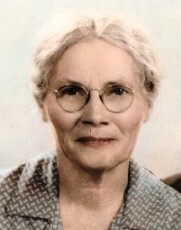 My earliest memories of Mama Hassie (Hassie Daniell Dawson) was seeing her working with her flowers and her vegetable garden and coming to our house near Hog Mountain Road. She would walk up to our house and bring flowers or vegetables or pick some vegetables that had “come in” in Mama’s garden. I can see her with her straw hat and long sleeve shirt one summer day on our front porch as she was leaving. She would use the term “You All” and she did that day. Her Southern Manners made a lifetime impression. Mama Hassie was a quiet, dignified person with family pride. She told me more than once, “Be yourself, don’t pretend or “put on airs”. She encouraged all family members to work hard, be honest and dependable. 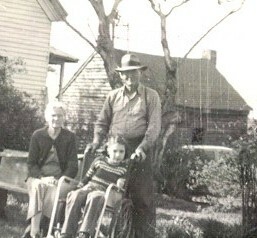 My earliest memory of Daddy Cliff (Royal Clifford Dawson- Died in May 1949) was his sitting on our front porch one day and letting us little boys play “horsy” on his crossed leg. He spent time talking to us and playing with us. He would take a break from work in the field across the road (now Cliff Dawson Road). Once he told me if I would bring him water to drink in the field, he would pay me a dime as “water boy”. I remember doing that more than once. As small boys, we would go to “Town” on Saturdays.Town was Athens and downtown. Sometimes we would take milk and butter to customers in south Clarke County. During WWII we would sometimes be paid in Tokens that we could use for rationed items at the “Store”. My Daddy, who had migraines and hated trips to Athens on Saturday, would drive. 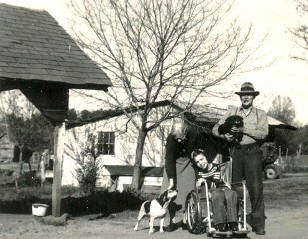 He would sometimes wait while Daddy Cliff took Terry and me to Dawson’s Grocery on East Broad Street and to Moon-Winn Drugs. He would buy us an ice cream cone. He would tell folks with pride that we were his grandsons. Many thought we were twins. 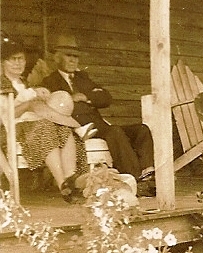 Most memories of Mama Hassie and Daddy Cliff are about things that occurred at the “Dawson Homeplace”. We visited there often – during the week and weekends. I remember being there during “hog killing” and “working the meat” in the kitchen after the hogs were slaughtered, cleaned and butchered at the fire pot near the branch below the big house. On Sunday, Mama Hassie would prepare a huge meal for “company”. Often, many of her 10 children and their spouses and children would come. Small children would eat around a table in the kitchen. The adults would eat around the large dining room table. 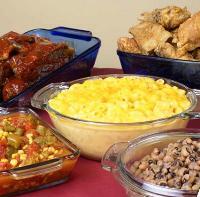 The table would be full of meats and vegetables:corn, peas, beans, “salet”, slaw, fruit salad, ham, beef, biscuits, cornbread and sweet ice tea. Deserts would be cakes (chocolate, coconut etc) and pies would be potato, chocolate, apple, peach etc). Church, family health matters, politics and high school sports were often discussed. Uncle George Norris (Sara Sue- and eldest Dawson Daughter) was very firm in his political beliefs. He was a strong advocate for Bogart High School where his children attended. Daddy and Uncle Fonnie Dickens (Selena Kate and “Carolina” to my Daddy) were avid Watkinsville basketball fans. I remember Uncles Fonnie and George having some tense discussions! They were strong advocates for their respective schools and the rivalry was very intense in those days. After “Sunday Dinner” we cousins would play in the yard and under the house. Some of us older ones (Patsy Dickens, Peggy Stewart et al) would set up imaginary play houses under the big house. We had old dishes and pans and used long thin boards to line the rooms. Our imaginations would do the rest. Some of us boys (Wayne Dickens, Terry and I) would play “cowboy”. We used sticks and strings for our “horses”. We would pretend to be Hopalong Cassidy, Roy Rogers, Gene Autry, Lone Ranger and many more we heard about on the radio and saw in comic books. 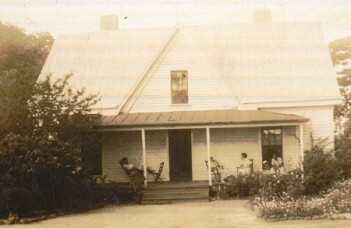 The old smoke house was behind the house. Hams, sausages, shoulders etc would be hung in the back room for the winter. Sometimes, they were covered in salt in salt boxes in the little log cabin above the house near the “High Cotton House”, “Poison House” and “long cotton house”. The cabin also had a large wooden box where wheat was stored for later grinding for flour. On the end of the roof ridge of the Old Smoke House was an iron frame that held the old Dinner Bell. I can see Mama Hassie pulling the rope when dinner was ready. Daddy Cliff, Daddy and the Hands would come to the house and take the harness off the mules and let them run in the barn lot. They would come to the house to eat. The Hands would eat at the table in the kitchen while we ate in the dining room. After a big meal, and an hours rest, they would return to the fields and plowing. The spring and summer work day usually started at sunup and went to sundown. In the back yard was a blacksmith shop where mule gear was kept and where plows were sharpened. 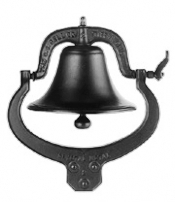 I remember my Dad, Daddy Cliff and “Hands” heating the iron under some fire from a bellows. 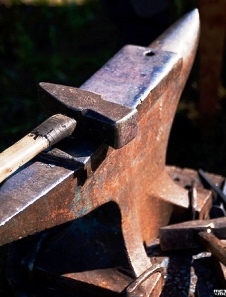 They would then pound the iron on the anvil with a large and heavy hammer. 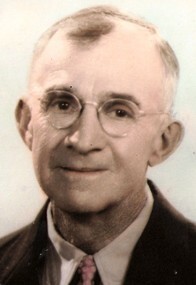 A neighbor from Daniells Bridge Road (Cliff & Elsie Hinesley) would walk to the blacksmith shop and sharpen his plows. I can see “Mr. Cliff” now sweating in his straw hat and long sleeve khaki shirt as he heated the iron and pounded the plow points. Another prominent fixture in the backyard of the Homeplace was the Well Shelter. It was made of wood and covered with wood shingles. It was high enough for adults to stand under to draw water from the well. It was shade in the summer and shelter from rain when outside. The well had a boxing around it and a windless and rope with a bucket. I remember Daddy Cliff and Daddy on many occasions drawing a bucket of water and “Ohhing and Ahhing” about the cool and refreshing drink. An old gourd dipper was kept in a special pocket on one of the posts. Most of the time, we drank with the gourd and at times we drank “straight out of the bucket” still dripping from coming up from the well.